I’ve been taking a bit of a break from work on Drowning Songs since handing in the draft, to work on two very different pieces. The first is Parlour Game, a text score created for Trinity Laban’s Rude Health series of experimental music events; and the second is a new graphic score, Sepiascape with Grey, created for Valentina Pravodelov who, having completed her MMus in classical piano this year is now studying for an MMus in voice, focusing on popular music. It’s been a good thing, I think, in terms of how I think about my music and specifically about how I’m approaching composition and the whole freeing-up process that started with A Sketchbook of Mushrooms. My MFA project seems to be starting to focus more clearly on notation and the exploration of different ways to convey the more flexible ideas that I come up with when I work on a piece away from the manuscript and away from the computer, so it’s been good to take a step backwards and think about what’s going on when I’m not dealing directly with traditional notation. Parlour Game is the first time I’ve made a text-based score. It’s based on the children’s game of Chinese Whispers and is structured more like a set of game rules than anything else. The number of performers is flexible (three or more), the actual material used is entirely open and may even be audience-generated (although the audience at the first performance was, it has to be said, a little reluctant to be involved! ), a lot of it is improvised performance, both musical and dramatic, and yet watching the performance, in spite of so very many parameters being intentionally placed beyond my control, it still felt like ‘my’ piece. I’ve always been slightly uncomfortable when working with improvisation (I’ve written about this before so apologies if I’m repeating myself!). I really enjoy making graphic scores and I love hearing what performers make of them, but I never feel like the music is really “mine”. The score is definitely mine, but the music belongs to the performers, even when I can hear how it relates to the score. Possibly the difference between Parlour Game and graphic scores I’ve made is that it contains a whole series of parameters that influence the performance, whereas my interest with graphic scores is in hearing what the performers’ imaginations make of something. I feel that if I have such a defined idea of how I want a piece to sound that I need to dictate how performers interpret graphic gestures, then I might as well write that out in notes. The ‘score’ of Parlour Game provides a context for the performance (the singers represent a ‘family’ sitting around, bored, after Christmas dinner), a process for the piece (‘rumours’ circulate through the audience and down to the performers, who use this as the text for singing/arguing), some suggested pastimes while portraying boredom (singing Christmas carols, reading aloud); it sets out parameters for the performers: what to do when a text is received by a performer, the possibility of rejecting a text with suggested phrases for this, graphic melodic suggestions and text-based descriptions of modes of delivery (“shout and stamp your tiny foot”, “get a little tetchy”), a suggested way of ending the piece. For the first performance, in addition, I was the one who selected the source material (readings and ‘rumours’ were taken from Dickens’ A Christmas Carol) and set the dress code (tacky Christmas). Maybe this had something to do with it, but I think the ownership of this piece came more in the setting of parameters than in the detail. Although, that said, the use of some of my suggested phrases possibly also played a large role in how much of myself I see in the piece. Sepiascape with Grey is almost completely different from Parlour Game. It’s serious where Parlour Game is intensely silly, for a start! Unlike most of my previous graphic scores which have tended to be created quite spontaneously, this one has been through about 7 different drafts before I felt the balance was right, with each version addressing issues that the previous one had raised about my own thinking, and in particular what I usually assume about the musical languages used by my performers. 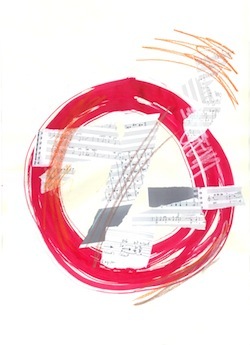 Unlike my previous graphic scores which have all been intended for musicians from a classical/experimental background, Sepiascape with Grey is intended for a programme of darkly urban music by bands such as Massive Attack, Portishead and Joy Division. Now, I’m the first person to admit that – technically – I know very little about popular music, and I found that in the early stages of thinking about this piece I got very caught up in superficial ‘constraints’ such as verse/chorus structures, repetition and unvarying metres. Gradually, though, I realised that these elements are not really things that need to be referenced in the score but rather that they are part of the performer’s equipment that they may bring to the piece – in exactly the same way as flexible metres, fluidity and unfixed structure are part of the language of the experimental musicians I am more accustomed to creating graphic pieces for. I am not writing popular music with this, merely trying to present an appropriate framework within which popular music could happen if the performers choose to drawn on those elements. Ultimately, I found myself focusing on textures and timbres, trying to create a structure with these elements that would sit well with the other pieces in the programme. Text was a particularly tricky aspect of this piece. Most popular music is song, and most popular songs work within a pretty traditional verse/chorus structure. I dallied (very) briefly with the idea of writing some lyrics to go with the score, but I discarded this idea quite fast. Mostly this was because it seemed to make an assumption that would tie the performers into a particular structure, which rather goes against what interests me about creating graphic scores. I considered leaving out a text entirely, but that too didn’t feel right – whether because the piece really needed the text, or perhaps some deep-rooted assumption about vocal music needing words, or possibly just because so much of my recent work has had a textual element to it. I have no idea at this stage how Valentina has approached the piece (although I’ve had an email in which she says it’s working well – hurrah!) but I’m really looking forward to hearing the result in January! In the past couple of days I have started ‘real’ work on the piece. My ideas for the opening solidified quite early, but I kept thinking that I should map out the structure of the piece and then work out which texts to use with what. However, I found that I was having a lot of trouble thinking about the structure without considering the specific text I should use. I guess that even though the musical structure will work independently of a textual structure, it’s still dependent on the text in the same way that when I create structure diagrams for instrumental pieces, they are often based on textural blocks. Without the texture in mind, the structure doesn’t happen, and in this case without picking out the text I wanted to work with, the structure wasn’t happening. I had originally thought that I might be able to hang the whole piece on the letter, but I think now that that’s not going to work. It’s so very personal that I’m reluctant to use it whole, to dissipate the poignancy of its message through the mechanics of dividing the text between the voices. I had already thought to use just fragments of text from the Method, so now I’m thinking of doing the same with the letter, focusing on phrases which can represent so many similar letters that have been sent to grieving families over the centuries. I also have a few fragments of poetry that were used in a document from the Shackleton expedition, as epitaphs for lost expedition members. Plus the names of drowned Merchant Navy seamen (I have a book of these on order at the Caird Library – due in on Tuesday! ), plus an assortment of words that I’m thinking of as “drowning rhymes” in the manner of Britten’s Rejoice in the Lamb’s “shawm rhymes”, “flute rhymes” etc. (which you can hear from about a minute into the following track). These “rhymes” will be words like DOWN, DROWN, BURN and BREATHE. Not exactly rhyming, but related in the sounds they use (D/B, DR/BR/BUR and the progression of the vowel sounds) and also related to the reported experience of drowning. I’ve worked up a first draft plan for the opening using these words, showing what I want to do with them. I think it’s fairly clear, but I’m not sure yet how much of the graphic information will make it into the score – I’m still working through some ideas in this respect. I’m thinking that the piece will proceed via passages of compression and relaxation. This comes from the Method: “sufficient air for the maintenance of life could be introduced by alternate compression and relaxation of the chest walls”. ‘Compression’ will most likely be rhythmic homogeneity while ‘relaxation’ will be more loosely connected material. I’ve never compiled a text in this way before. It’s a very different way of thinking than working from complete passages or poems. The need to convey a sense of the whole text is removed because it is entirely appropriate if only fragments are comprehensible by the audience in this situation. I’ve chosen this approach because recently I’ve started to feel quite hemmed in when working with complete texts. The reason I rarely set rhymed poetry is that I feel I need to completely break the poem in order to make it appropriate for music. If I don’t then the music seems crippled by the poem’s own internal music (which all good poems have. And many bad poems too). By using fragments, it feels more like the music is in control and that the structure will develop from musical requirements, not textual ones. The other benefit is that I can include multiple levels of meaning in the words I’m using, which is something that really appeals to me and something I touched on slightly when writing my own text for Breadcrumbs earlier this year. At the moment there are elements of the physical experience of drowning, resuscitation methods, grief and the personal and institutional expression of sorrow, and the very personal specificity of the names of people who have actually died. I’m hoping that the book of names I’m seeing on Tuesday will yield something I can use – not sure what content I could use to fulfil this role if those documents don’t provide something useful. It’s very important to me with this piece to use – for want of a better word – authentic texts. The specific stories behind the words I’m using are a large part of the power of that text. This may not be something which conveys to an audience, but it matters to me as I’m writing it, and hopefully once the choir knows that the names are the names of real people who drowned, the letter fragments are from an actual letter, the poetry was chosen as a memorial to real people, that it will colour the approach they take in singing this material. There’s a level of respect that goes along with a true story, a gravitas, which cannot be matched by invention, no matter how plausible, and I feel that to try to fake any part of this is to belittle the pain of those who have died and those who have lost people to the sea. In our latest ‘All Composers’ session, the question of whether we do or should consider our audience when writing was raised. Now, I know well that this is a question that’s kind of been done to death and this is not a post about whether composers in general should or shouldn’t. I don’t think that discussion is particularly helpful. What I do think is helpful is for individual composers to consider the role the audience plays in what they do and how they perceive what they do. For me, I don’t think I do really consider the audience that much while I’m writing. I’m more interested by what I feel to be the internal drive of the piece, about creating something that to me feels satisfying and that is appropriate to the situation I’m writing it for – if it’s something I’m writing for a particular performer, what are their strengths, weaknesses, interests and things they want to work on? if it’s a piece I’m just writing for fun, then what parameters (if any) do I want to set myself? What I do think I do, which I hadn’t really considered before, is to spend a fair bit of time stepping back from a piece and trying to consider it from an audience member’s perspective – does it hang together? If I pretend I don’t know what’s coming next, does this bit still work? what is the overall structural balance like? In the context of needing to push myself to take more risks, I wonder whether this step in the process might not actually be counterproductive – is this the point at which I sanitise music that might be less conventional to fit into some mould I’m not even conscious of trying to fit? Do the things which sound unbalanced to me actually sound excitingly wobbly to other people? I’m thinking now that these are questions I probably should be exploring. Sometimes, certainly, this process can take a pedestrian section of a piece and make it more interesting, but maybe more would be learned by just writing it, giving it to performers, then hearing it and writing a new piece which learns from what’s been done in the workshop. I guess this is largely what my work on A Sketchbook of Mushrooms was tackling, although I didn’t think of it in these terms at the time. What do you think? What role does the audience (either real or imagined) play in the development of your creative work? Is it important to you for your work to be perceived in a certain way? I’ve been doing a lot of thinking about my MFA project and how to approach it. The topic has been built around two commissioned pieces, and since receiving feedback on my final recital – which boiled down to ‘needs to take more risks’ – I’ve been trying to balance in my mind the needs of the commissions – to create a satisfying work, suitable to the performer and his/her focus and musical interests while producing work that not only fits with my research questions, but actively experiments with the issues raised and leads me to a better understanding of what I’m trying to investigate. It’s a tricky balance and I’m feeling that I need to do a LOT of research around the subject matter of these two compositions – on drama, text, poetry and stage design for the opera, and on Richard Long’s art practice, Dartmoor and modern song cycles in general for Crossing Dartmoor. The last week or so has seen some big changes to Breadcrumbs, the dramatic monologue for unaccompanied soprano that I’ve been composing for soprano Julia Weatherley. In particular, I’ve been working on creating context and space for the drama that is implied in the piece. While the text explains fairly clearly (I think!) what is going on and how we got there, it is quite wordy and the issue of time passing and the aspect of what the character feels or experiences which goes unsaid were things that still needed to be addressed. Fortunately, the Tête à Tête opera festival has been on over the past few weeks, and I’ve managed to get to several performances of new short operas which have been hugely helpful in working through ideas about dramatic space. In particular, Judith Bingham’s unaccompanied soprano rendition of the story of fossil-hunter Mary Anning (part of the Fossils and Monsters performance by Alison Wells) was extremely helpful. The gaps left between phrases, her use of a tiny patch of pebble-beach for the performer to crunch over, the tapping of smooth beach-stones the character is holding in her hands, and the inclusion of half-remembered phrases of hymns all contributed to make a very well-paced, vibrant performance, and helped me to begin to understand some of the finer detail of how Breadcrumbs should work in a performance. The biggest issue, I felt was how to convey a feeling of passing time. While the piece only takes about 5 minutes to sing, it needs to be clear to the audience that it all happens while Gretel is wandering about in the woods over a much longer time-period, more like several hours. While writing the text, I had considered explicitly stating this – the section “Twilight, twilight, evening, past crepuscular and into more prosaic night-time” is intended to show that the day has ended while she’s been singing. Even at the point of assembling the words, though, I felt that while the “twilight” bit worked, to make the passing of time more explicit would probably be a bit too heavy-handed. The Téte à Téte performances helped with seeing how the staging can really make the most of pauses and little random snatches of melody. I found that the Bingham piece had some quite large gaps in it, but that they didn’t seem as large as they were, on reflection, because of the visual aspect of the performance – Wells wandered around, crunched over the little beach, looking for ammonites among the pebbles, hummed half-forgotten snatches of hymns, all of which gave a strong sense of a larger context, both physical and temporal. Originally I had notated pauses in performance with fermatas and breath marks, to indicate long or short pauses.It began to feel like these did not give enough information for the performer though, and I revised the piece while considering why the singer was pausing – what is the dramatic purpose of the break? and what is she doing while it is happening? 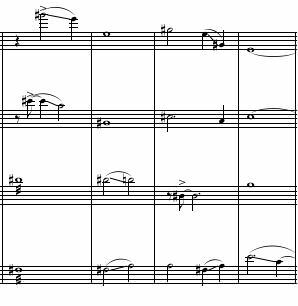 Once I had worked these out, I removed most of the previous pause marks, replacing them with either notated rests, or blank bars with stage directions such as “Pause to listen, as if expecting a response. Slump with a sigh when it becomes clear he’s not answering” and “Check pockets, or show hands to show you have nothing”. Thinking like this really brought the music to life for me and – oddly enough – expanding the breaks actually seemed to knit the piece together more strongly. In particular, there are one or two places where a sudden change of mood is called for by the text – adding in stage directions made sense of the context for these sudden changes, and I think they also help with conveying how long a pause should be, based on dramatic, not just musical, time. I was fortunate enough to have this near-final draft of Breadcrumbs sung by legendary soprano Jane Manning at a sight-reading workshop held by Téte à Téte on the 18th of August. 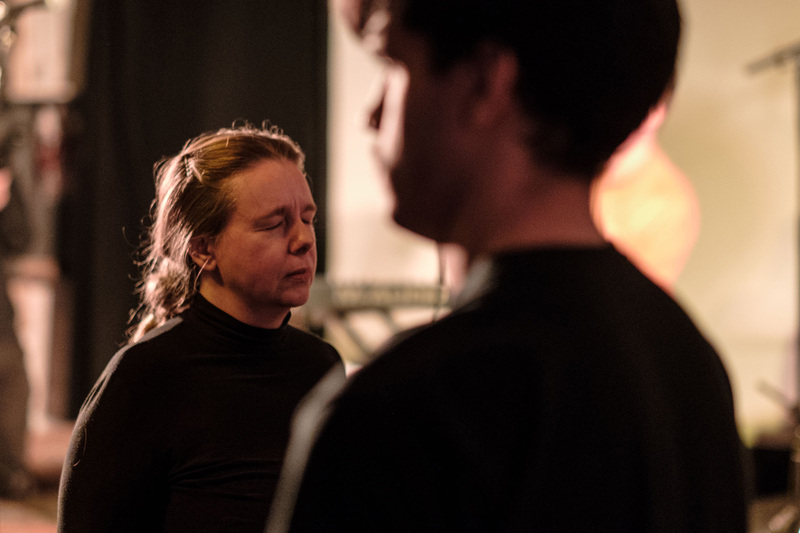 This was an incredibly helpful experience – Manning delivered a very well characterised performance which has really helped me determine the final tweaks to the piece. Overall, I was very pleased with how the work turned out in this performance (also very pleased to hear from my teacher that Manning loved it!) and there are very few changes I’ll be making. The main things are a couple of additional repetitions of phrases/sections which seemed to be over too quickly, and therefore didn’t make enough impact for the dramatic sense they needed to convey, and I’m thinking of tweaking some of the notes to include a glissando here and there – up till now all the notes have been solid pitches, but I think a little flexibility would be very effective. Onwards and upwards – just a week to go till my Major Portfolio is due in! I’m nearing the end (finally! I hear you squeak) of my string quartet based on Rothko’s Seagram Murals. It now has a proper title – Red on Black on Maroon – and I’m working on the final section and giving serious thought to how I’m going to finish it. One of the most important things I’m considering at the moment, both in terms of material for the final section, and in terms of adding shape and interest to the parts I’ve already composed, is different qualities of sound. It’s the truly glorious thing about writing for string instruments – the vast array of sounds you can get from a single instrument. There are so many more options than just bowed and plucked and lately I’ve been trying to build a palette of sounds to use across the work, with particular consideration for the final section. 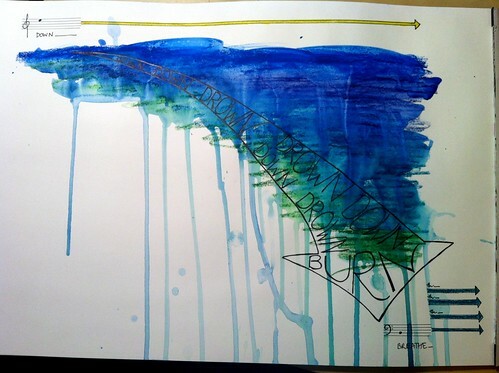 The piece divides roughly into three sections, each around 4 minutes long. The first section is almost entirely chordal, the second has a lot more meandering melodic material, but the third – which represents viewing the paintings from Rothko’s preferred distance of 18 inches – deals in the incredible detail you can see when you’re that close to a Rothko work. The first view of the Seagram Murals is that they are incredibly simple – each one a big block of colour on top of a different big block of colour – but once you’re up close, you can see that neither block of colour is actually just one colour. Rothko’s technique involved building up layers and layers and layers of subtly differentiated shades, and differing types of paint too, which gives the surface a depth and detail which is hard to discern from a distance. So the final section is about tiny, delicate details, all related to the chordal and melodic material that’s gone before in the piece, but each moment more complex and more independent than in either previous section. So, like I said, I’ve been building a palette of sounds. I started out with just ‘normal’ bowing, tremolando bowing and some pizzicato, and I always knew I wanted to use harmonics in the final section. Recently, though I’ve added in non-vibrato sounds, bowing sul ponticello and sul tasto, flautando (as a nod to the harmonics in the final section while reserving that particular tonal colour & pitch extreme for the end), some use of mutes, overbowing and – finally – bowing the wood of the instrument. I think this is where I’m drawing a line with the sounds. There have been two key influences in developing this palette of sounds. The first is Janacek’s second string quartet, ‘Intimate Letters’, which Deirdre Gribbin pointed me to during the brief series of lessons I had with her. I’m enjoying the Emerson Quartet‘s very vigorous rendition of this piece at the moment. Janacek uses sul ponticello very effectively in this piece, and the glassy sound was just the contrast I needed for a certain section of the piece, and from there, it’s proved a useful sound elsewhere. From using sul ponticello, I contrasted it with sul tasto in places, expanding the palette in a different direction. Given the focus of Red on Black on Maroon on the pulsing phenomenon that is experienced when you sit looking at the Seagram Murals for any extended period of time, I’m feeling that the occasional use of these sounds will give a more organic feel to the progression of the music, especially in parts where I’ve been feeling that pitched material gives too precisely musical a realisation of what I want, when what I really want is more of a bodily sensation. I do hope that makes sense… I’m using them in quite a different way, I think, than Edd seems to be aiming for – more of a slow organic gesture than aiming to evoke actual breathing. My main focus recently has been a 5-minute dramatic monologue for unaccompanied soprano, called Breadcrumbs. I’m writing it for Julia Weatherley, a marvellous singer who is also studying at Trinity Laban Conservatoire of Music and Dance. She asked me to write a 5-minute unaccompanied piece for her final recital in September and we decided that this would be an excellent opportunity to test out some ideas surrounding the chamber opera I’m going to be writing for her next year. Hence ‘breadcrumbs’. 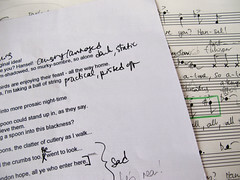 The opera is to be based on fairy tales and my idea had been to take the arc of a well-known fairy tale, which at the moment will probably be ‘Hansel and Gretel’, but – inspired by Jennifer Walshe‘s multilayered theatrical work – to use it as a framework to hang all sorts of other related material from. I did a lot of thinking about how this layering might happen and the text was kind of an obvious starting point. I considered writing my own text. Then I considered commissioning a libretto, then collaborating with a librettist, and finally came full-circle to face the idea that if I was even considering writing a whole libretto, I should first have a go at writing some text for something shorter. Which is this piece. Even more than most of my other pieces, ‘Breadcrumbs’ has had quite a huge research/mental incubation phase. I read (and am still reading) a number of books of fairy tales – Joan Aiken and Jan Pienkowski’s stunning The Kingdom Under the Sea which provided the visual stimulus for the opera’s concept; The Annotated Brothers Grimm; and Angela Carter’s fascinating The Bloody Chamber, which a friend lent me and which is retellings of fairy tales from different perspectives and with a very modern sensibility; L. Frank Baum’s volume of American Fairy Tales. I thought about other material I might want to weave into the production, particularly tangentially related stories – things which aren’t really fairy tales or folk tales but which in my mind are related – Dante’s Inferno [sideline: have you seen that Clive James has just released a translation of the whole Divine Comedy? OMGSWOON! ], Arthurian legends, Susan Cooper’s The Dark Is Rising books, The Wizard of Oz. I slowly developed a structural concept for the piece – the context is that Gretel is alone in the wood with evening drawing on. She has lost Hansel and is angry at him for the breadcrumb plan going wrong. The piece draws an arc showing her feelings for him – anger at him, worry for him and for herself, joy at finding him again – with a touch of anger thrown in again as it so often does when a child has wandered off and then been found again. Interspersed among her outbursts are expressions of fear and wandering thoughts. Breadcrumbs! Breadcrumbs! Such an original idea! My brother the genius – Hansel, where are you? Hansel! Breadcrumbs! Breadcrumbs! I hope the birds are enjoying their feast – all the way home. I’m so afraid of the dark. A darkness a spoon could stand up in, as they say. I don’t have a spoon right now, but I believe them. Who’s them? Why did they think to bring a spoon into this blackness? Darkness reveals the worst of us. Abandon hope, all ye who enter here. I’m a bad sister, I know it. Poor Hansel! To sample the quality of the night. I can hear his bright sunshine-laughter. That same yellow laugh he gave, so full of delight to go hunting with my father – joy at any new shiny thing. Is that a light? Is it?! Such a wonderful smell! So sweet-spicy! Gingerbread! Honeyed beacon! Oh sweet illumination! 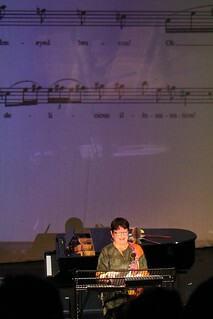 It didn’t really change very much from this until I started to compose the piece, several weeks later. As I’d been hearing the notes in my head while writing the text, I felt I was fairly aware of the musical shape I wanted the work to take. My biggest problem was trying to work out what the actual pitches should be – as a dramatic piece there’s a certain amount of parlando, sighs, indefinite pitch stuff and I found it quite difficult to interpret what was in my head into pitches either on the piano or attempting to sing myself – not being a soprano about a third of the piece lies above my range and it just didn’t sound right trying to sing it an octave lower or as notes on the piano or if I attempted to squeak it at pitch. I suspect this is something that just requires practice. Hansel! Hansel, where are you? Hansel! Each alone in the dark wood, each alone. So dark, dim-shadowed, so murky-sombre, so alone, so alone, so alone. I’m sure the birds are enjoying their feast – all, all, all, all, all the way home! Next time our father takes us out to kill us – next time! – I’m taking a ball of string. Past crepuscular and into more prosaic night-time. I’m so afraid of the dark. A darkness a spoon could stand up in, so they say. I don’t have a spoon – I don’t! – but I believe them, I believe them. Visions, I have visions of groves of standing spoons, visions, visions. A clatter of cutlery as I walk. Breadcrumbs. The bread’s all gone. And the crumbs too. Oh Hansel. My Hansel. My brother. Darkness, darkness reveals, reveals the worst of us. Is that a light? Is it? And I can hear my brother’s sunshine-yellow laughter! Hansel! Where have you been? Where have you been?! I’m pretty pleased with where the piece is now and have sent it off to Julia to get her initial impressions, discover if any of it will be impossible to pitch and so on. I do suspect, however, that I may end up extending some of the more arioso sections – in particular ‘past crepuscular’, ‘groves of standing spoons’ and maybe ‘abandon hope’ as at the moment the piece feels perhaps a little fragmented by veering back and forth between recitative and arioso sections. This may involve having to write more text, or possibly I can do it just with repetition or wordless sounds like the humming towards the end. Have you ever written your own text for a composition? How did you find the experience? Please share in the comments! So it’s been nearly a year since I started my Masters degree at Trinity Laban Conservatoire of Music and Dance – 11 months – and today I’ve been doing a little thinking back to where I was then and where I am now, as I take a short break from working on pieces for my final recital in September. I’ve done a lot of experimenting this year, and worked through some big concepts and while I think my overall soundworld hasn’t changed a lot, I find that the way I think about music and how I write has altered considerably. I have discovered value in music which on a first hearing I found quite impenetrable, so that I no longer believe that music shouldn’t be hard work to listen to any more. I don’t believe in difficulty for difficulty’s sake, but different types of music require different levels of effort – and different levels of effort for different people – and I feel that my previous ideal of enjoyable-yet-challenging is no longer relevant. Not because I don’t want that any more but because issues of difficulty or ease of listening don’t really matter much to me now. I’m more interested in dissonance now than consonance, instability instead of balance, texture more than line. True, I still think more linearly than harmonically, but whereas melody used to be a key factor in my work, I now feel it’s secondary to texture. I’m finding stasis more interesting than momentum quite often, although I don’t imagine I’ll stick with that for long – there’s too much fun to be had with other approaches. So I guess I need to write a shiny new credo. It’s harder than it seems – right now everything feels very open, very much in a state of flux. All paths seem valid to me now – when I wrote the present credo I felt I knew where I was. Now I don’t really. If that sounds negative, it most definitely isn’t. I am delighted to be confused! From my perspective now, when I wrote that credo I was frozen, stuck with these rigid ideas that prevented me from exploring new ideas, that restricted me to learning from things I already liked or was predisposed to like. It’s like the past year has opened up the whole world of music for me to learn from. Ending a piece can sometimes be even harder than starting one. The fear of the empty page is one we all face regularly, but the fear of ending is another thing entirely. It can stem from all sorts of issues: perfectionism, where we want everything to be just right before we send it out into the world and so tinker manically with tiny details instead of drawing a double bar line and having done with it; procrastination – for whatever reason we just can’t make ourselves work on it – this could be boredom, lack of ideas, a niggling feeling that something’s not right and it “just needs time” to sort itself out; or maybe it’s just fear – of what the world thinks of it, of what we’re going to do when we no longer have this security-blanket fallback piece to work on. I’ve been working on my string quartet based on Rothko’s Seagram Murals since October now. Eight months. And still the wretched thing isn’t finished. This piece has dragged on so long that it now has its own hashtag: #stringquartetofdoom and I’m beginning to doubt whether I CAN finish it. I’ve been here before, of course – the 3 minutes of Carrion Comfort that took 9 months to write looms large in my memory. And given my history, eight months on a 12-minute piece isn’t that bad really, but I need it done and into rehearsal before my lovely quartet skip off on their well-earned holidays. I think the quartet (really must stop calling it the String Quartet of Doom and find it a proper title) falls a little into all three categories. I’ve felt a strong affinity for the material ever since I came up with it, so it’s become a bit of a security blanket – I like listening back to it, even in Finale’s dodgy rendering – but I’m also getting tetchy and bored with it because I’ve been doing battle with the same notes for so freaking long now. I’m concerned that after all this time it won’t turn out as well as I hope it will, which is a real worry as it represents what will be about a third of my final recital grade. I keep going back over stuff I’ve already written and tweaking it to be better instead of writing new stuff and then there’s just plain old procrastination because I’m fretting about certain problems with it (and whether they are problems at all or just differences of opinion but that’s a whole other blog post). Obviously the answer is “just get on and finish it” – which I’ll do once I’ve finished this post… I hacked the end off it last night because I wasn’t at all happy with it, and am feeling much better about the whole thing since doing that. My Cy Twombly project is now at an end – I handed it in on Thursday – so I thought it would probably be a good idea to just put down my thoughts about what it achieved, given that it changed direction so much over the course of the project, and my thinking about what it achieved changed vastly just through the process of writing the thing up. The project started out as a composition-based exploration of how visual arts techniques and elements could be directly ‘translated’ into music, my idea being that I might possibly be able to use these translated elements to compose music in the same way that these things go together in visual art. My previous posts cover this part of the project in some detail and while they’ve rendered some possibly-useful things (the Kandinsky-based cipher to convert lines and angles into music may be of use in the future) the last two pieces, Mushrooms VI and VII are the ones that have really made an impact on me. Following the mess-making of Mushrooms III, IV and V, I made another two collage-scores with the specific aim of then rendering them as notated music. Initially, I was thinking of this process as being basically creating an interpretation of a graphic score, just written down. However, working through them, I found that I was thinking in quite different ways about these collages and how I was extracting music from them. I found I was using them more like reference tables, like tools – not as a source I was trying to render in a different form, but like something I was mining for details which I was then working with in my usual fashion. It’s hard to explain and I spent half a day on Wednesday tearing my hair out trying to work out the difference between what I feel I was doing and interpreting a graphic score, and I think the difference comes down to the role I feel the collages play in this process. They are not the piece. They are something I’m using to create the piece. While I went through a brief period of thinking that possibly the collage should be as legitimate a source of the piece as the notated version (in much the same way as Carrion Comfort exists as both notated orchestral piece and graphic score for any forces), in the end I felt that neither of these two collages really WERE the pieces I’d made – and indeed could well be used to create other pieces. The most important factor I found in working like this was that it completely overcame my resistance to working linearly. I’m beginning to suspect that the linear approach is what may make it difficult for me to write longer pieces, why so much of my music up until this year was only about three minutes long. I find it difficult to keep everything in my head when I’m working from start to finish, but working with the collages, seeing all the fragments of music I was working with laid out visually, it made new connections and made me see how each small fragment might be extended, combined with other fragments, and so on. To the extent that I was finding so many ideas in these collages, that both pieces’ durations are dictated pretty much solely by the fact that I had to have them ‘finished’ in order to workshop them. Mushroom VII, in particular, I feel was just getting going when I cut it off. So I’m definitely going to use this process again – indeed AM using this process again, on a piece for vocal quartet plus four-hand piano that I’m working on. I’ve used a visual approach to cut down the text (a poem written by my father) to be appropriate for a 5-minute piece and am about to embark upon the next stage in the visual process, which will involve identifying the key parts of the text for repetition and emphasis using the same visual method. Looking forward to seeing how this works in the ‘real world’!